First time filmmaker Mike Hickey grew up in Grand Falls. A fan of horror movies and ghost stories, there was one local tale from his childhood that stuck in his mind. “I remember when I was a kid, there was a house that was kind of spooky,” remembers Hickey. “It was this big mansion downtown off Goodyear Avenue, on a street called Dunn Place. Now living in St. John’s, Hickey took part in an introductory filmmaking course with NIFCO, the Newfoundland Independent Filmmakers Cooperative. There, he came up with the idea of basing a film on the Grand Falls ghost story. In addition to the course, NIFCO also offers a first time filmmakers program to help new artists make their first movie. Hickey worked with local fimmaker Roger Maunder on the project. 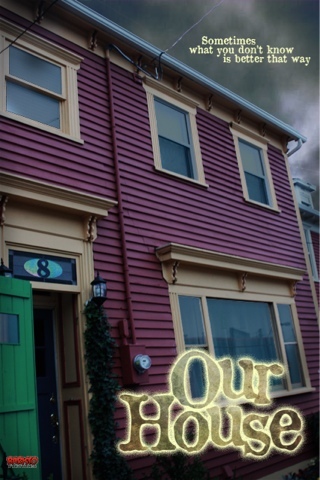 The story of “Our House” revolves around a couple who arrive in a new town. They move into an old house, where strange things start to happen. The film is now finished, and Hickey plans on a local screening sometime over the next few months. After that, he will submit the film to festivals. Hickey is hopeful that “Our House” will be a step towards getting more movies made. Hickey is coy on how the movie ends, however. For details on the launch, you can follow @hickeycommamike on Twitter.